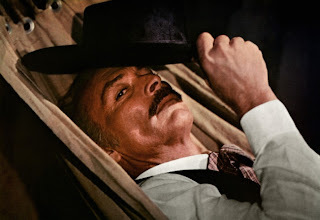 A lyrical Spaghetti Western with clever stylistic shadings and a strong central performance, The Grand Duel (also known as Storm Rider) entices with an unusually adroit plot and an impressive set of memorable characters. 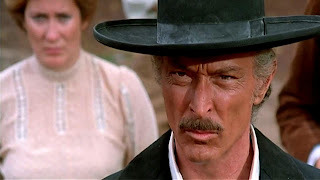 Discredited Sheriff Clayton (Lee Van Cleef) catches up with escaped convict Philipp Wermeer (Alberto Dentice, billed as Peter O'Brien) just as a group of bounty hunters are closing in. Clayton helps the nimble Wermeer escape, much to the disgust of the lead bounty hunter Hole (Antonio Casale, credited as Antony Vernon). Clayton believes that Wermeer, who has been convicted of killing the wealthy "Patriarch" Samuel Saxon, is a victim of a miscarriage of justice. Clayton knows the identity of the real killer and wants to help clear Wermeer's name. The two form an uneasy alliance and make their way to Saxon City, now run by David (Horst Frank), Eli (Marc Mazza) and Adam (Klaus Grünberg) Saxon, the sons of the dead Patriarch. David is the ambitious power behind the scenes, Eli the token Sheriff doing the dirty work, and Adam the rather unbalanced, effeminate yet blood-thirsty youngest son, about to be married to Elisabeth (Dominique Darel). The Saxons are ready to seize the rights to a large silver deposit discovered by Wermeer's dead father, but the unexpected arrival of Clayton and Wermeer disrupts their plans. Director Giancarlo Santi was Sergio Leone's Assistant (or Second Unit) Director on both The Good, The Bad And The Ugly (1966) and Once Upon A Time In The West (1968), and clearly he was paying good attention. The Grand Duel is rich with Leone-inspired camera angles, ostentatious prolongations, sharp dialogue, sly humour, and plenty of bullet-rich action, style as important as substance, a lot achieved by saying little. 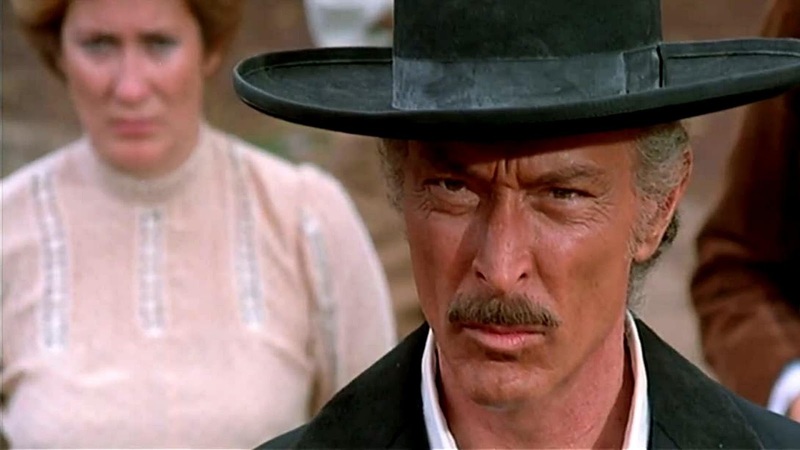 Lee Van Cleef is dominant as Clayton, dressed all in black, having lost his Sheriff's star for reasons that will become clear late in the film, but all the more free in the meantime to pursue justice without it. Alberto Dentice provides the dynamic athleticism to contrast with Van Cleef's economy of motion, and the two create a duo brimming with trouble towards each other and more violently towards the assembled bounty hunters and the Saxons. The Grand Duel benefits from a large supporting cast of well-defined characters, with each of the Saxon sons efficiently provided with a distinct personality. David is laying plans for the political capital that can be purchased with wealth, while Eli leads the on-the-ground rule-by-gun. Adam occupies an exclusive class of derangement, a dainty murderer inhaling the aroma of his silk scarf while getting high by brutally gunning down innocents. Jess Hahn adds gruff colour as the wagon driver trudging his way across the west, his path ever conflicting with Clayton and Wermeer. Argentinian-Italian composer Luis Bacalov provides an exalted orchestral musical score to accompany the unfolding drama. Pinned by a hypnotic and melancholy harmonica melody, it is one of the more inspirational non-Morricone Spaghetti Western themes. There may be slight deficiencies in originality and slickness of execution, but otherwise The Grand Duel is a hearty Spaghetti Western dish.